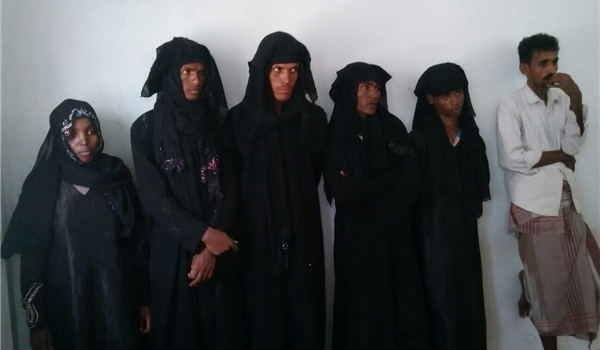 JNN 15 Aug 2015 Sanaa : An Ansarullah security official said on Friday that the country’s intelligence and popular forces have arrested a Saudi-linked group of Ethiopian men who attempted to sneak into the capital, Sana’a, in women’s clothing to carry out terrorist attacks. “The Yemeni intelligence forces alongside the popular committees identified and arrested a terrorist band affiliated to the Saudi spy services who intended to enter Sana’a to carry out terrorist attacks on mosques and bazaars,” the official told the FNA. “The captured terrorists are Ethiopian nationals and have been arrested by the Ansarullah forces in the Yemeni capital,” the official added. The source further added that it is not the first time that the country’s intelligence forces have arrested terrorist men in women’s dress. In late July, a car bomb exploded in the Yemeni capital, Sana’a, and killed at least three people and injured six others. According to local media reports, the deadly bomb attack took place near a mosque in an area in the Southwestern part of the city. The ISIL Takfiri group has claimed responsibility for the deadly bomb attack. On June 29, the terrorist group also claimed responsibility for a bombing which reportedly killed nearly 30 people in the Yemeni capital. The ISIL militants also claimed a June 20 car bombing against Qubat al-Mahdi Mosque in the Yemeni capital, which killed three people and wounded 16 others. Saudi Arabia has been striking Yemen for 142 days now to restore power to fugitive president Mansour Hadi, a close ally of Riyadh. The Monarchy’s attacks have so far claimed the lives of at least 5,392 civilians, mostly women and children. This entry was posted in Jafria and tagged deadly bomb attack, intelligence forces, terrorist attacks, yemeni capital. Bookmark the permalink.